The next East Village Association membership meeting is 7 p.m. Monday, Oct. 4, in the Happy Village at Wolcott & Thomas. Nicole Aquino of LaSalle II school is the featured speaker. 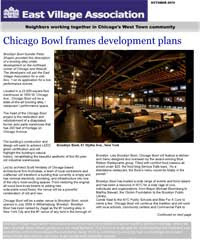 The latest East Village News can be downloaded here. There are details on a bowling alley seeking a live-music license for Chicago & Wolcott, plus the new West Town branch library, renovation plans at the Division Street CTA station, and even the ecological impact of dog waste. Join us for a special guided walking tour of the Make Believe art in vacant storefronts installations TONIGHT Friday October 1. The group will meet at 1266 N Milwaukee at 7pm and take a guided tour of the Make Believe art installations. During the tour, participants will meet the artists and learn about their work. The tour ends at the Flat Iron Artist's First Friday celebration where you can join in the art + fashion fun of First Fridays at 8pm. To RSVP for this great FREE program click here: http://pivotalchicago.pingg.com/October1. On Friday, October 1 at 8pm join Borderbend Arts Collective at Happy Dog Gallery (1542 N. Milwaukee, 2nd floor) for "Bicycles and the Arts," a true multidisciplinary event. Bicycles and the Arts creatively explores connections between these two vital elements of culture and society, it will include readings, an art exhibit and musical ensemble performance. There is a $7 suggested donation at the door. This event is designed for all ages and open to the public. For more information contact: info@borderbend.org or call (312) 380-9223. Visit the Art Moving West exhibit entitled "The City as Studio" opening Friday October 1 from 5-9pm at the Wicker Park Art Center (2215 W North Ave). Call (773) 278-7677 for more. Come check out Chicago's 1st annual street festival celebrating the home. This FREE fall festival will have over 50 design-themed vendors and great live music. Design Harvest will be held October 2-3, from 11am-7pm on Grand Ave. between Damen and Wood. For more information visit: http://www.design-harvest.com/. On Sunday October 3, join other Chicago area runners for the annual Bucktown 5K race, a fully paved route that meanders through the leafy streets of Bucktown. Runners will begin at 1621 N. Marshfield at 8:30am. A map of the course and race entry details can be found here: http://www.bucktown5k.com/raceinfo/, the race entry fee is $40. Note that NO parking will be allowed on the course starting October 3rd at 4am. Check out this page for more parking details: http://www.bucktown5k.com/raceinfo/neighbors/.